A high-quality wine cellar door is essential to storing wine effectively. Wine cellar doors form a barrier between the wine cellar and the rest of the home or commercial space, which helps to maintain proper temperature and humidity levels. This allows your wine to age in an environment that doesn’t risk a negative impact on its quality. A carefully engineered wine cellar door is designed to block air movement in both directions and provide high thermal insulation value. The door, therefore, must be constructed to fit precisely into its frame, without affecting the ease of how it’s handled. Wine cellar doors differ from regular interior doors in that they must withstand two different climates on either side. When you don’t use a door designated for wine cellar use, you risk losing the benefits of storing your wine in a controlled climate. A steel frame is essential to your custom wine cellar door because it has the durability required to support the door which must stand forces resulting from two different climate conditions on both sides. An automatic drop seal ensures there isn’t any air exchange caused by gaps beneath the door. To keep the door closed and prevent it from opening unexpectedly, wine cellar doors should include concealed magnets within the frame. Advanced security options for your wine cellar door include manual or electronic locking options; this way, you are assured that your wines are secure when left unattended. The trusted wine cellar design specialists at FWC will support you in selecting the correct wine cellar door. Although a wine cellar door is used primarily for functional purposes, it also serves as the entrance to your wine cellar and is an important component to creating a compelling design. To create an inviting entrance, your wine cellar door should follow the same theme as the rest of the space. Cellar doors can be glazed or non-glazed. A non-glazed door can be of choice to keep the treasure away from sight, while glazed doors are asked by the majority of the cellar owners who prefer more transparency. In either options, the solid parts of the door can have wood, metal or even more fancy genuine leather finish. If your wine cellar has a modern feel, consider incorporating a sleek and simple door. 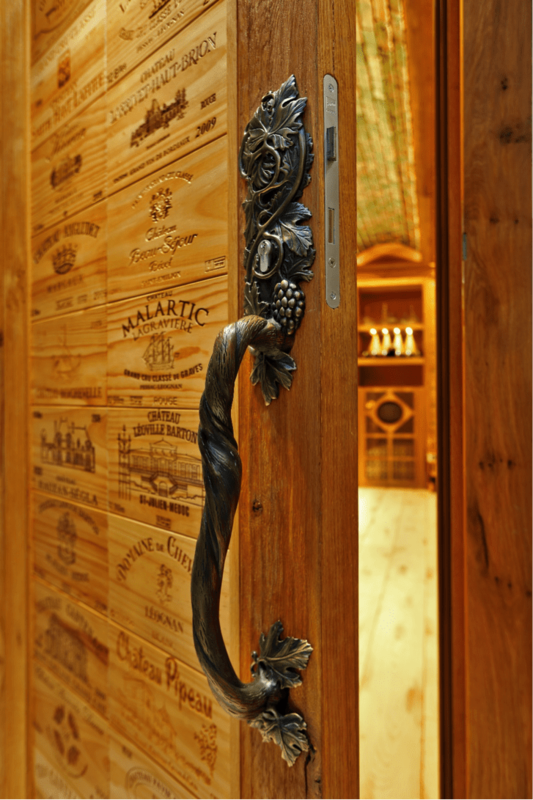 For a classical wine cellar, choose a more intricate wood door with or without decorative carvings for an elegant effect. Working with the wine cellar designers at FWC will help you refine your tastes and choose the best option for your private, commercial, collective, or industrial wine cellar.